Church volunteers, working with local contractors, built the Chartres Cathedral-inspired labyrinth in honor of Debbie Clegg, a beloved church member and tireless teacher and volunteer in the Fox Island/Gig Harbor community. Debbie died of cancer in 2014, but her love and influence lives on at the Fox Island UCC. Debbie inspired others to learn about, visit, and walk labyrinths as an enjoyable method to peacefully reflect on life and spirituality. The labyrinth was dedicated on 29 October 2017. A labyrinth is an ancient pattern that appears in many cultures. It has a path which leads in a circuitous route to an intricately designed center. Often mistaken for a maze, which has multiple entries, paths, and dead ends, a labyrinth has only a single path, with no dead ends, and it is impossible to get lost within one. The Fox Island UCC structure is concrete, 32 feet in diameter and is a “7 circuit” labyrinth, which takes about 2 minutes to walk at a measured pace. It is a resource for moving meditation --- a path of prayer where body, mind, and spirit meet. Don Clegg, husband of Debbie Clegg, displays the new sign which will point the way to the labyrinth’s location at the back of Fox Island United church of Christ. 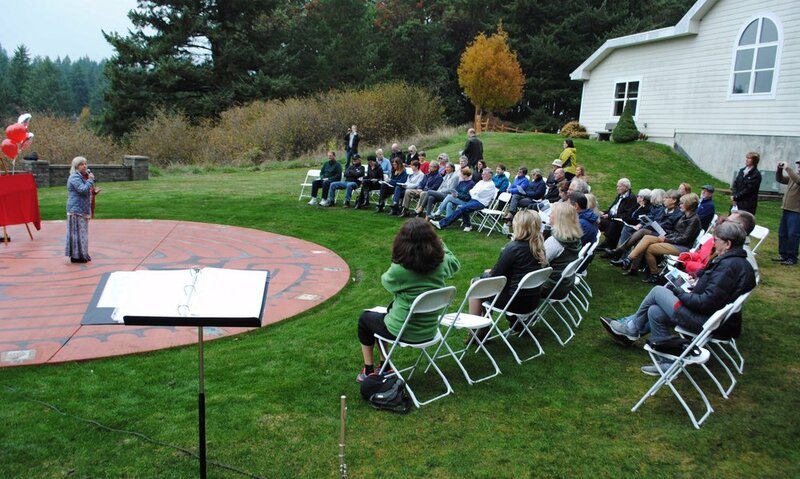 The congregation extends an invitation to all in the community who would like walk the outdoor labyrinth and enjoy the beautiful views of Puget Sound. Reverend Janet Matthews and George Metzger add finishing touches to the landscaping around the labyrinth.